NB. The Chassis Register is compiled by the Austin Seven Clubs Association (A7CA) from information supplied by individual Austin 7 owners, either directly to the Registrar or through A7CA Member Clubs, Associate Clubs or Austin Seven Model Registers. The A7CA therefore, cannot be held liable for any errors or any inaccuracies that may exist in the information that appears in the Register. In particular any description of any car should not be taken as having been verified or substantiated by the Association. Remember to include correct spacing when searching with a Registration Number. Two Additional Club columns have been added because many Austin 7 owners belong to more than one Austin 7 Club. The A7CA Website version of the A7CA Surviving Austin 7 Register is now in MS Excel 1997-2003 xls spreadsheet format, which is hopefully available to the majority of users. A7 Questionable Entries, which highlights those entries that are duplications in the data entered in the Register or some other query that is arising from the data that the A7CA Registrar requires help in resolving. The most common query arises when one Chassis has two (or more) Reg. Numbers, or one Reg. Number with two (or more) Chassis numbers. An * in Column A indicates this is information from the Year 2000 Register, but not confirmed since. An * after a Registration Number indicates this is the latest number carried by the car. The previous number(s) can be found in the Previous Registration column. So if you can help to sort the query out please contact the A7CA Registrar. Big A7 Questionable Entries, which highlights those entries that are duplications in the data entered in the Register or some other query that is arising from the data that the A7CA Registrar requires help in resolving. The A7CA American Austin/Bantam Register (Only in Chassis Number because there so few listed in the register! In March 2013 all the A7CA Member Clubs, Associate Clubs and Austin Seven Model Register, throughout the world, were contacted and requested for a copy to of their current Austin Seven Register, in order bring theA7CA Surviving Austin 7 Register up to date. This is an on-going process that is hoped to be completed by the Summer 2013. The A7CA Committee will then decide on how to publlish the A7CA Surviving Austin 7 Register. 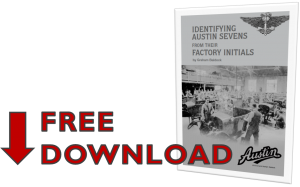 Ideally it is hoped that all the various Austin Seven Clubs and Registers will send a copy their Austin Seven Register to the A7CA Registrar on a regular annual basis as they complete their membership renewal process. Owners of Austin 7s and Big 7s can help individually by sending in the full details of their car(s) by using the Notification Form. It is suspected that there are still quite a number of Austin Sevens in the world that are not listed in the current A7CA Surviving Austin 7 Register. This is because either the owner is not a member of an A7CA recognised Austin Seven club and therefore does not know about the register, or updated details have not been received from their Austin Seven club in the last calendar year. IMPORTANT-Please note that Austin Seven Owners do not have to be worried about their names and addresses being published by the A7CA Register, because the A7CA Registrar does not need, nor want to know, the names and addresses of the owners of Austin Seven cars and chassis when the car’s data is provided through a A7CA recognised Austin Seven Club or Austin Seven Register from anywhere in the world. Should there be an enquiry about a particular Austin 7 then the A7CA Registrar will pass that enquiry onto the Secretary of the Austin 7 Club that the owner of the car belongs to, who will then pass the enquiry onto the car’s owner. It is then up to the Austin 7 owner if they wish to respond to the enquiry. Mostly these enquiries are from previous owners of the car who wish to pass on some history of the car to the current owner. Please use the Notification Form to send any amendments, additional details etc. to Roger Brown, A7CA Registrar. Please fill in as many fields in the Notification Form as you can, even if that information already appears in the Surviving Austin 7 Register as it helps to confirm that we have the correct data. Also, even incomplete information may be useful. To assist you in the identification of all the various serial numbers to be found on Austin Sevens please have a look at ‘Quote This Number’ (PDF file). This has been updated in March 2013 by the A7CA Archivist, Phil Baildon. Since January 2013 there have been a total of 1029 previously unknown Surviving Austin 7and 9 Big 7s entered into the A7CA Registers!!! From observing nearly 20% of the Austin 7s that were entered into the 2013 750 Beaulieu Austin 7 Rally, were not entered in the A7CA Surviving Austin 7 Registers, it was estimated that there may well be at least 2,000 Austin 7s that are yet to be included in the register. Re-calculating after the 2017 Rally showed 16% of entries were not on the Register, so progress has been made, but there is still a way to go. If you know of an Austin 7 that is not in the register then please complete the Notification Form and send it in. In September 2013, the A7CA Webmaster, Chris Charles, further updated the A7CA Surviving Austin 7 Register so that you can now print out a whole register(in landscape format)-but please be warned that there are over 200 pages in the whole register.